This is one of the crochet samples I picked up at the yard sale this morning. It measures around 12" long and about 5" wide. 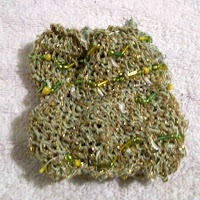 Here I've selected a variety of seed beads in a couple shades of green and yellow and, using elastic cord, strung beads through sections of the crochet. Carefully hand sewed the ends together and then weaved elastic through 3 sections. The piece is comfortable to wear on my 'between medium & large' wrist. The other piece is still sitting on the side table. I'm thinking of something similar, but different for that piece. I'll probably list this piece, but not until I have a few done and can start a section.